Asics Gel Cumulus 20 are neutral cushioned running shoes. The renovated Asics Gel Cumulus 20 starts its twenties with interesting changes to reduce weight around 10% compared with past editions, something that will impact perceptions (hopefully in the right direction) from fans regular users. As a direct competitor for popular Nike Air Zoom Pegasus 35 and always hidden from its bigger sibling Gel Nimbus 20, it is challenging for the japanese brand to introduce meaningful changes but current Gel Cumulus 20 not only replaces good old FluidRide™ with hyped FlyteFoam™ but also gets rid of classical plastic piece in midfoot (Trusstic System®) which added extra stiffness to whole package. Changes from its predecessor Gel Cumulus 19 have been introduced in upper as well which features new "Jacquard" mesh with several ventilation holes to improve breathability and takes advantage of well-known Asics logo overlays to provide a snug and secure fit. Well padded collar around the heel not only offers great comfort but also deals with odour and moisture thanks to ComforDry™ technology. 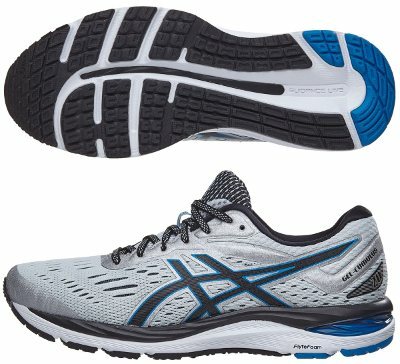 As mentioned above, midsole in Asics Gel Cumulus 20 moves from FluidRide™ to FlyteFoam™ using a similar solution than in premium Gel Kayano 25 with FlyteFoam Lyte as baseline and FlyteFoam Propel above it to combine a solid but soft response with some reactivity from reliable SpEVA layer on top of them. As expected there are a couple of Gel® units embedded for improved shock absorption, one in the forefoot and the other one in the rearfoot, partly visible from outside. Another small revolution takes place in outsole which offers full ground contact and no longer includes the typical plastic piece in the midfoot, so longitudinal groove (Guidance Line) gets major role to promote smooth transition. Lug pattern changes a bit keeping transversal grooves in the forefoot for great flexibility and quicker toe-off. As usual, harder AHAR+ rubber is used is more exposed areas to increase durability.